Things are getting wild in the Strip District. 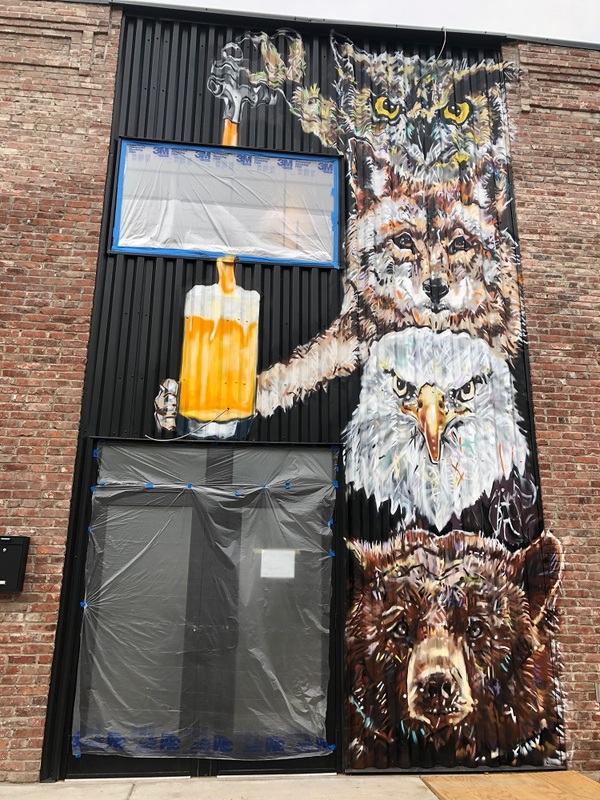 Artist Jeremy Raymer has painted a 250-square-foot mural of an owl, coyote, eagle and bear on the side of Cinderlands Warehouse, the brewery’s soon-to-open second location at 2601 Smallman Street. The animals, of course, are pouring a pint. “There are 200 different colors. 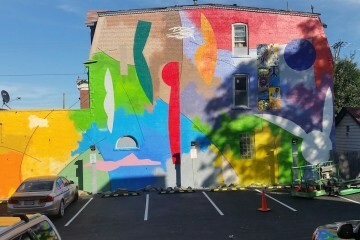 That is the most colors I’ve ever used,” says Raymer, who has created more than 50 murals throughout Pittsburgh. Cinderlands Beer Co. commissioned the masterpiece in February. Raymer says he is a fan of the food and beer and was happy to put his personal touch on the new location, which occupies the former Spaghetti Warehouse. The space is 17,000 square feet, much larger than Cinderlands’ Lawrenceville site. It will serve as their production facility and house a restaurant with seating for 300 inside and out. The space will open in the next few weeks. Raymer is already planning another brewery mural. Superman will soon adorn the rear wall of Voodoo Brewery in Homestead. It will be about 30 to 40 percent larger than his Magneto mural on the side of AAA Scrap Metal in Lawrenceville. Due to their high visibility, the murals are generating a lot of business for Raymer. He’s completed more than 10 projects since June 2018, including a Roberto Clemente portrait on the North Side and a battle between The Incredible Hulk and Wolverine on Heirloom Superfood Market’s building in the Strip. He says sometimes clients know what they want and are actively involved in the design process but often he is allowed to let his imagination run wild.